Summer, summer, glorious summer! Whether you’re squeezing in your plans last-minute, or jumping ahead to next year, there’s nothing like hot summer weather to make you think of fun days gone by or imagine picture-perfect happenings under the sunshine in the future. After all, now that the kids are out of school, getting the whole family together is as easy as it’s ever going to be. Pack up your swim fins, grab your barbecue recipes, and get ready for a summer family blast at our Gatlinburg chalets! Families have been coming to Gatlinburg for generations because, in the Smokies, they make an effort to offer classic family favorites that stand the test of time, while adding a little bit of something new and special every year. Since the mountains and woods are all around you in Gatlinburg, you won’t be able to miss Great Smoky Mountains National Park, but did you know about the Anakeesta Family Theme Park, which opened in 2017? With zip lines, tree canopy walks, a gondola and a roller coaster, as well as multiple bar & grill restaurants, it boasts that mix of indoor and outdoor all-ages family fun that brings people back to the Smokies each year, and offers a little something for everyone in a large group. You be expecting to have to make some compromises to accommodate a large group, but not in Gatlinburg! Chalets in Gatlinburg like the Birdhouse Inn and When Pigs Fly are built for family get-togethers and offer a whole range of amenities. The Birdhouse Inn is a 4 BR/4 BA chalet that sleeps up to 8, with 1 King-size and 3 Queen-size beds, a gas fireplace and hot tub, and a game room with a pool table. The kitchen is fully-equipped with all the basics you’d need to prepare a family meal, and the washer/dryer is especially useful to families with young children. The chalet is also located in Chalet Village, which means it comes with swimming pool and tennis court access in the summer, but the incredible view is available all year round. When Pigs Fly is another great option for groups of up to 8. This 4 BR/3 BA chalet is one of our classic mountain Gatlinburg chalets, nestled in picturesque surroundings, with 1 King-size and 3 Queen-size beds, pool and shuffleboard tables, 2 hot tubs, both a gas fireplace and a wood-burning fireplace, as well as a porch swing, 6 TVs, WiFi throughout, and a view of Mt. LeConte. Stay stressed at this chalet? When pigs fly! Gatlinburg chalets for more than 8 still have plenty to offer in the amenities department. OberBaden sleeps up to 10, and comes with luxury amenities like outdoor deck areas (including a grill), a game room with a wet bar, TVs with Blu-Ray and internet applications, a huge stone wood-burning fireplace, a hot tub, WiFi throughout, and a large, open, fully-equipped kitchen for hanging out in or preparing family favorites. Need a little more room? The 4 BR/4 BA Mountain View is one of our chalets in Gatlinburg that sleeps up to 12, and comes with beds in sizes from King to Twin, gas and wood-burning fireplaces, a separate hot tub deck, a fully-equipped open-plan kitchen, a master bedroom with private balcony, and WiFi throughout. Dogs are welcome, too – up to two canine companions can enjoy the Mountain View! Family Lasts Forever – Chalets Don’t! 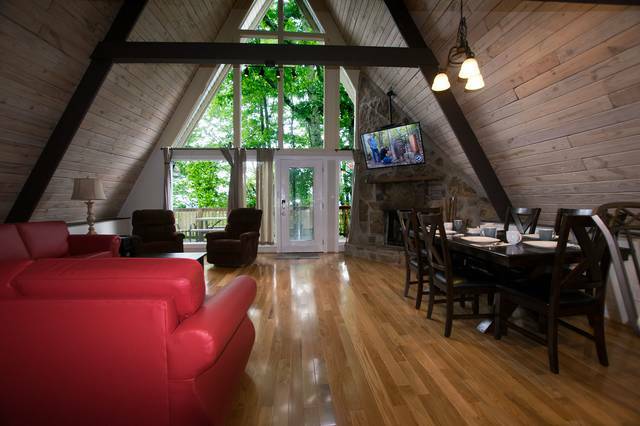 Chalets in Gatlinburg fill up quickly, so call Ski Mountain Chalets and reserve your family’s vacation lodging today!